To get my maverick mind in gear, I use mindmapping to take notes and to clarify thoughts about work or anything that needs doing. It is visual, confined to one page and when I write it down, the content tends to stick in my mind. try to change colour when capturing a different thought or subject or to indicate a different speaker. 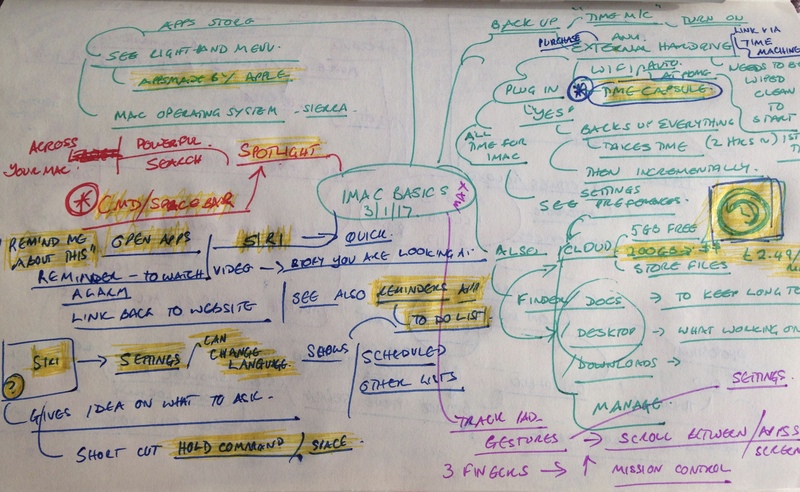 Here’s a mindmap that I made at an Apple store training course on the iMac. The notes are to remind me of what I was learning. I highlighted the key things I especially wanted to remember, so when I look back at my notes at any point, I focus on those items first. This mindmap was created using SimpleMind, an online tool. I like the clarity and the flexibility it gives me. I have used various similar online tools over the years, each one delivering all sorts of functionality. If you use the free version, you get enough functionality to create mindmaps online but as you might expect, there are fewer options, such as the ability to print. I generally use the most basic paid version. I like the flexibility it gives me and I am willing to pay for it. I don’t need the Rolls Royce version.